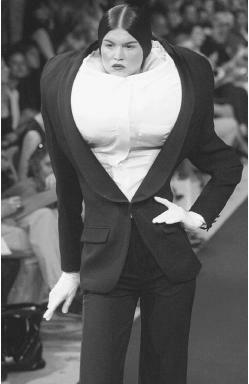 Viktor & Rolf, fall/winter 1998-99 haute couture collection: wool suit over puffed shirt. head of workroom, Kate Reilly, London, 1895-1900; saleswoman, Bechoff David, Paris, 1900-01; head of studios under Marie Gerber, Callot Soeurs, Paris, 1901-05; designer, Doucet, 1905-11; designer, Maison Vionnet, 1912-14, 1919-39; retired, 1940. Awards: Légion d'Honneur, 1929. Exhibitions: Three Women: Madeleine Vionnet, Claire McCardell and Rei Kawakubo, Fashion Institute of Technology, New York, 1987; Madeleine Vionnet, 1876-1975—l'art de la couture: Centre de la Vieille Charité, retrospective, Musée de Marseille, 1991; Madeleine Vionnet—les années d'innovation: 1919-1939, exposition, Musée historique des tissus de Lyon, 1994. Died: 2 March 1975, in Paris. Latour, Anny, Kings of Fashion, London, 1958. Koda, Harold, Richard Martin, and Laura Sinderbrand, Three Women: Madeleine Vionnet, Claire McCardell, and Rei Kawakubo [exhibition catalogue], New York, 1987. Demornex, Jacqueline, Madeleine Vionnet, Paris, 1989. Madeleine Vionnet, 1876-1975—l'art de la couture: Centre de la Vieille Charité, [exhibition catalogue], Marseille, 1991. Kirke, Betty, Vionnet, Tokyo & San Francisco, 1991, 1998. Alaïa, Azzedine, Madeleine Vionnet [exhibition catalogue], Marseille, 1991. Madeleine Vionnet—les années d'innovation: 1919-1939, [exposition catalogue], Lyon, 1994. Kamitsis, Lydia, Madeleine Vionnet, London & Paris, 1996. Chatwin, Bruce, "Surviving in Style," in the Sunday Times Magazine (London), 4 March 1973 (later republished as "Madeleine Vionnet" in his book, What Am I Doing Here?, London, 1989). "Madeleine Vionnet, A Revolution in Dressmaking," in The Times (London), 6 March 1975. Imatake, S., "Inventive Clothes 1909-39," in Idea (Concord, New Hampshire), September 1975. Morris, Bernadine, "Three Who Redirected Fashion," in the New York Times, 24 February 1987. ——, "A New York Exhibition Traces the Evolution of Modern Fashion in the Designs of Vionnet, McCardell and Kawakubo," in the Chicago Tribune, 11 March 1987. Smith, Roberta, "Three Women at the Fashion Institute of Technology," in the New York Times, 13 March 1987. Weinstein, Jeff, "Vionnet, McCardell, Kawakubo: Why There are Three Great Women Artists," in the Village Voice, 31 March 1987. Kirke, Betty, "A Dressmaker Extrordinaire," in Threads (Newtown, Connecticut), February/March 1989. Dryansky, G.Y., "Madeleine Vionnet: The Modest Charms of a Farmhouse in Cely-en-Biere," in Architectural Digest, October 1994. McColl, Patricia, "Madeleine Vionnet: A Youth Movement for the Venerable Couturiere," in WWD, 13 September 1999. Loyer, Michelle, "The Sleeping Beauties of Fashion are Waking," in the International Herald Tribune, 11 October 2000. Madeleine Vionnet's inexorable synergy is the body of her extraordinary dresses. Her draping on the bias gave stretch to the fabric, a fully three-dimensional and even gyroscopic geometry to the garment, and a fluid dynamic of the body in motion as radical as cubism and futurism in their panoramas on the body. Her work inevitably prompts the analogy to sculpture in its palpable revelation of the form within. Some accused Vionnet of a shocking déshabillé, but Vionnet was seeking only the awareness of volume. Bruce Chatwin, writing in the Sunday Times Magazine in March 1973, commented, "No one knew better how to drape a torso in the round. She handled fabric as a master sculptor realizes the possibilities latent in a marble block; and like a sculptor too she understood the subtle beauty of the female body in motion and that graceful movements were enhanced by asymmetry of cut." The only rigidity ever associated with Vionnet was her definite sense of self: she closed her couture house in 1939, although she lived until 1975. She lamented the work of other designers and disdained much that occurred in fashion as unprincipled and unworthy; she was a true believer in the modern, scorning unnecessary adornment, seeking structural principles, demanding plain perfection. Fernand Léger said that one of the finest things to see in Paris was Vionnet cutting. He used to go there when he felt depleted in his own work. Vionnet draped on a reduced-scale mannequin. There she played her cloth in the enhanced elasticity of its diagonal bias to create the garment. In creating the idea in miniature, Vionnet may have surpassed any sense of weight of the fabric and achieved her ideal and effortless rotation around the body in a most logical way. When the same garments achieved human proportion—their sheerness, the avoidance of decorative complication, the absence of planes front and back, and the supple elegance of fabric that caresses the body in a continuous peregrination—were distinctly Vionnet. While bias cut was quickly emulated in the Paris couture, Vionnet's concepts of draping were not pursued only by Claire McCardell (who bought Vionnets to study their technique) before World War II, but by Geoffrey Beene, Halston, and other Americans in the 1960s and 1970s, Azzedine Alaïa in France, and Japanese designers Issey Miyake and Rei Kawakubo in the 1970s and 1980s. Mikaye and Kawakubo were alerted to Vionnet by her strong presence in The 10s, 20s, 30s exhibition organized by Diana Vreeland for the Costume Institute of the Metropolitan Museum of Art in 1973 and 1974. One of Vionnet's most-quoted aphorisms is "when a woman smiles, her dress must smile with her." By making the dress dependent on the form of the wearer rather than an armature of its own, Vionnet assured the indivisibility of the woman and the garment. It is as if she created a skin or a shell rather than the independent form of a dress. Like many designers of her time, Vionnet's external references were chiefly to classical art and her dresses could resemble the wet drapery of classical statues and their cling and crêpey volutes of drapery. At Doucet, she had discarded the layer of the underdress. In her own work, Vionnet eliminated interfacing in order to keep silhouette and fabric pliant; she brought the vocabulary of lingerie to the surface in her détente of all structure; she avoided any intrusion into fabric that could be avoided. Darts are generally eliminated. In a characteristic example, her "honeycomb dress,"all structure resided in the manipulation of fabric to create the honeycomb, a pattern that emanates the silhouette. Elsewhere, fagoting and drawnwork displaced the need for darts or other impositions and employed a decorative field to generate the desired form of the garment. The fluidity of cowl neckline, the chiffon handkerchief dress, and hemstiched blouse were trademarks and soft symbols of a virtuoso designer. In insisting on the presence of a body and on celebrating the body within clothing, Vionnet was an early-century original in the manner of Diaghilev, Isadora Duncan, and Picasso. But there is also a deeply hermetic aspect to Vionnet who remained, despite the prodigious research revelations of Betty Kirke, a designer's designer, so subtle were the secrets of her composition, despite the outright drama of being one of the most revolutionary and important fashion designers. At the end of the 20th century, Vionnet's name was revived and once again adorning fashion. After the label was acquired in 1994, scarves and fragrances tested the waters for a full revival of the Vionnet name. A new boutique on the rue Montaigne, where Vionnet's own house used to reside, was planned as well as ready-to-wear and couture lines.